If you are just getting up, feeling good, relieved that it isn't raining yet, and checking your email and your favorite website before driving to Cheat Fest, then make a note to visit Director Mallow and Abus. Look for the above pictured booth and hopefully one or both will be seated within. 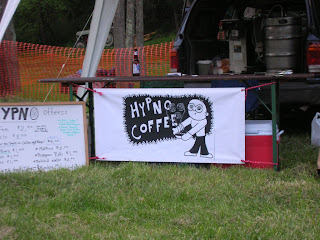 No festival happens without headaches, and Cheat Fest is no different for the HypnoStaff. Yesterday we found out the water supply was simply a big plastic cistern from which livestock can subsist, but for coffee brewing it would leave much to be desired. A brief panic, a few expletives, than entered...Willy! 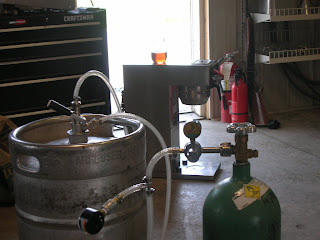 Our local purveyor of pub fun concocted the home health, keg, and coffee solution currently being employed at the festival. Willy, myself, and Mike built the beast; it uses two (2) kegs filled with water, the water is pressurized with an oxygen bottle, and the pressurized water supplies our commercial coffee brewer. Brilliant! So thank yous and kudos to Willie and Mike, you saved our cheese!! Not to be out done by the coffee scenario, our double order of bagels are still MIA. No one said running the coolest coffee shop in West Virginia was going to be easy, and no one is always right. I received one broken message this morning from the HypnoStaffers and after the HypnoCrypto Team completed deciphering the recording we extrapolated; the home health, keg, and coffee rig both works and doesn't work...no... works(! ), Abus can fit five (5) adults in the Big Agnes(? ), Chris can drink his weight in the cistern water...or...PBR(? ), then there was laughter...or...screams. End transmission. I realize most of you are either at Cheat Fest or on your way, but for the few stragglers, waiters, waitresses, and those under house arrest, we have fired up the mothership in Thomas and Summer, Chloe, Charlie, and I are goofing off awaiting more tales from the madness.